the Venezuelan government has not yet reimbursed this government money as promised. During the sitting of Parliament on Thursday, August 11, Gonsalves, in answer to a question posed by Leader of the Opposition Arnhim Eustace, said as at the end of July 2011, a total of EC$8.78 million was paid by the Government of St. Vincent and the Grenadines to Cuban workers, at an average monthly rate of $368,572. None of the money has been reimbursed by Venezuela. At a press conference on Monday, August 22, the irate prime minister reminded his audience that the money expected from Venezuela is not a debt, but a gift. He also pointed out that the people of St .Vincent and the Grenadines should be grateful for Venezuelaâs contribution, given that they have been so willing to assist financially in the past. âThe way some persons have commented and carried the story, it is as though Venezuela owes us this money and they havenât paid it; and they should be traduced!â said Gonsalves. Gonsalves outlined several instances of Venezuelan assistance, including: several million dollars towards the construction of the international airport; donation and delivery of three wind stations; and the setting up of a laboratory for Cuban workers to conduct soil testing. âAll of that [for] free!â exclaimed Gonsalves. He also spoke of a loan from the Petro Caribe fund towards the international airport, to be repaid at 2 per cent interest over 25 years. 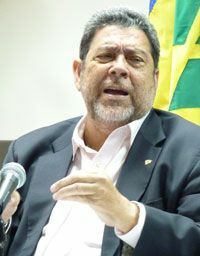 Gonsalves also mentioned that the Venezuela government sent food, water and medical supplies after Hurricane Tomas struck the island last year; and donated $9 million towards the relief fund. âThe very country which has been extraordinarily generous, you want to pick on them?â he questioned. The prime minister said that what the Venezuelan government had intended as a display of â Bolivarian solidarityâ has been twisted into some kind of debt owed to the country. âThey donât owe us!â he admonished.